Charity lets you create personalized WordPress sites in minutes with an easy to use visual composer. If you want to create a website for crowd funding or an official website for your non-profit organization, Charity is for you. 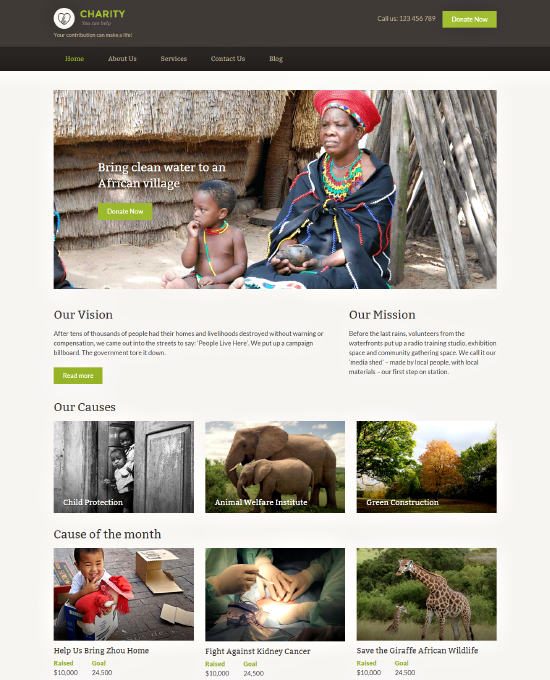 The Charity theme is a very easy to use theme which lets you manage the website design with a front end editor. What you have in end is a mobile friendly, elegant and full functional charity website. For ecommerce facilities in your website(receiving donation) you can use the WooCommerce plugin. WordPress is one of the most well-liked Content Management Systems out there nowadays. I love it because it is so flexible and yet simple to learn and pick up. You can select the depth you need to go into depending on your need. Are you a small business owner in a hurry to put up your individual website to promote your business? WordPress is the answer. A WordPress theme is good-looking and attractive. There are lots of themes out there – several are free for use, and several you have to pay a little penny for. But there is a lot to select even among the free themes. You can search for these themes based on your industry category – food or eating place, realty, eStore, Blog, Magazine etc. When you select a theme that has been made for your niche like church, you have selected something that pleased your requirements about 70-80%. Sort of like your home. And the rest can effortlessly be obtained by decorating or enhancing the theme. An extremely good and attractive web template can attract the reader to visit your website, but it cannot attract you to read regarding the website to the content interests you. So after you are certain that you either desire a business web template or WordPress templates for church or any other appropriate web template, choose what your content will be. You might desire your content to be extremely informative or static or you might desire it to be adventurous and active. Generally, website templates for church need to be chronological & religious. It is obvious that your content will tally the type of website that you have. As well as the written content, you can attach photos too. Photos are visually attractive and assist in increasing the good looks of a site. Once you are sure regarding your content, you can buy your template or even get a template downloaded for free. Determine the type of website theme you require. Thousands, if not millions, of WordPress themes, are accessible and the designs range from industry, portfolio, blogging themes, personal, e-commerce, and numerous more. Knowing what you actually need and determining where you desire to focus will assist you to decide on the kind of theme you desire and have to use. Check for compatibility. Usually, the WordPress theme must be compatible with WordPress’ latest version. Make certain the theme designers provide regular updates of the theme whenever required. This will make sure that your website is kept up-to-date with the newest WordPress version. Several of the improvement you can add or changes are headers, social media features, background colors, etc. It is essential to apply a high-quality design sense because there is no limit to the various frills you can include. The greatest thing about WordPress is that it’s completely out of the box resolution to build a website. Webmasters can utilize WordPress to obtain unparalleled control over how their blog or site appears & they can do so with extremely limited technical knowledge or even none at all. One more great quality of WordPress is the prospect to apply special design layouts to your site and to do so through the click of a button – there are exactly millions of WordPress themes for church accessible in the market and the savvy webmasters will normally spend a great deal of time survey what is on offer and finding the theme that gives them the most control over the look of their website, and looks the most good-looking for their particular niche or sector. The easiest method to find the most excellent church WordPress theme your website or blog is to perform a rapid search in the main search engine. Numerous blog owners spend all their time writing regarding how to blog and these are usually the people who compile very long lists of all the best-looking WordPress themes in the market. Create a church website that visually represents your worship space, reflects your ideas, and inspires people to know more about your church. This premium WordPress theme is ideal for churches, Charity, Non-Profit purposes, Mosques, or other religious groups to create their website. It has a neat and responsive design, is easy to use, flexible. There are abundant customization possibilities with this Church WordPress theme. With this Non-profit WordPress theme, you have all the possibilities to create a feature packed Church website with events, donations, and blogs. On the other hand, it works perfectly even if you want to create a simple church website for your local church. Ultimately, you are in control! What’s more? You can create a professional looking church website without writing a single line of code. No need to hire experts to create and maintain your website! The Church WordPress theme is one of the excellent themes for a religious website, where you can share your beliefs regarding your religion and invite people to join your institute.Create a church website that looks great on any device it is viewed on. This Church theme is responsive and promises a clean, lossless view, on any screen of different sizes and resolutions. Even the menus are designed for smooth navigation regardless of the device your visitors use. A Mobile friendly church website ensures that your visitors can access your site and browse through it anytime, anywhere! This speed optimized Church template is easy to install and use. It takes a click to install the theme and another one to install the sample data. With this done, your website will start appearing like the theme demo. All you have to do now is to replace the sample data with your original content. A flawless navigation ensures that your viewers easily find what they’re looking for, without getting lost. It’s easy to navigate with buttons that lead to important areas of the website. You can use the widgets and display all the important details right where you want. With an intelligent arrangement of widgets, you can accommodate the important links easily. You would want to create a church website that looks unique, don’t you? Therefore, this Religious WordPress theme comes with all the customization options that you’ll need to change how your church website looks. Change colors of your website easily through the WordPress live customizer. You can manage your website with the easy back-end options. Activating and deactivating features of your church website is a matter of clicks. Customization options are organized so that you do not mess up the look and feel of your website. So you can change the colors and design while maintaining a consistency in design throughout your website. This Church website script comes with an inbuilt feature of receiving donations through a form. You can easily create a “Give” or “Donate” button on your website to accept donations from your visitors. The Church WordPress theme gives you an easy way to create causes and accept donations from your visitors. The interested donors can just make online payments through your Church website. The whole donation system is inbuilt and fully functional. If you have a PayPal account, all you need to do is to link your PayPal account to your church website and start accepting donations. So you can create a church website with different causes and can accept donations. The Church WordPress theme is compatible with WooCommerce. The free WooCommerce plugin adds new possibilities for your Church WordPress theme. Not just the store features, but WooCommerce can be used for a variety of eCommerce purposes. If you want to run a mini online store besides your Church website, WooCommerce provides you all the tools to do so. It comes with easy payment processing, inventory, tax and shipping management features. A contact form is important on your Church website. Make it easy for your visitors to get in touch with you. All the visitors who are looking for counseling, or have questions should have a medium to ask you questions. Therefore, the Church WordPress theme comes with a ready to use contact form page. Here, you can mention your address using the google maps. You can even mention your contact details like phone numbers, email, fax, etc. You also have a working contact form. Your Church WordPress theme can do much more besides showing prayer schedules and church history and donations. Show event listings on your church website as a separate post type. The Church WP Theme comes with an ability to create event listings on your websites. You can use this section to show the upcoming events at your church or religious institute. This Church WordPress theme is programmed with strict SEO standards. Moreover, it provides compatibility for the best of WordPress’ plugins like Yoast SEO, All in One SEO Pack, etc,. Thus, not your theme files, but also the pages you create and the content you add is SEO optimized, resulting in an SEO friendly website. The homepage of your church WordPress theme is designed to reflect the purpose of your website. But, this Church theme is multipurpose and can be used for different purposes. The Church theme’s homepage is widgetized and so, you can decide where you want each element of your homepage to appear. You don’t actually have to be a designer to make your website look the way you want. The homepage structure can be changed by rearranging the widgets. Move them in and out of the different home page widget areas and you can organize the homepage just like you want. 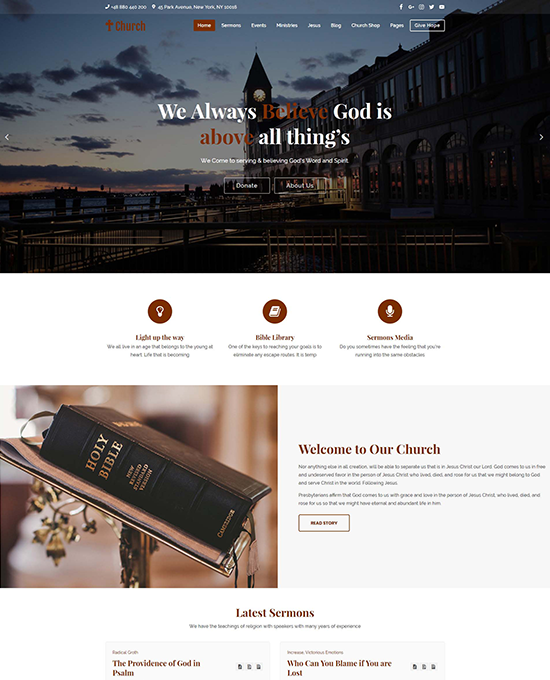 This a modern WordPress church theme is designed for the best user experience. You can create a website that can translate into multiple languages using the WPML plugin. Moreover, for single language translation of your WordPress Church website, you can use the provided a .PO and .MO files. Through the blogs on your Church website, you can state your purpose clearly. You can share your stories and important news easily. Interesting blog content can make your visitors spend more time on your website. Through your blogs, you can show the ways they can take part and connect to the church. Blogs on your Church theme supports threaded comments and this can help you know people’s opinion on what you say. Even though the church and non-profit websites are generally not created with the intention of earning a profit, this best Church website template comes with all the features to let you earn through it. The Church WordPress theme comes with advertisements widgets. You can choose your widget areas and place the ad widgets there to display the advertisements. You can opt to show text/graphical/video ad banners or Google AdSense advertisements. If you don’t want to use the widgets and monetize your church website, you can use them to display important notices and announcements in form of banners. The widgets integrate seamlessly into your design without spoiling your website’s appearance. What kind of websites can you create with this Church WordPress theme? The beauty of this Church theme is in the fact that it is very flexible. It can be used for any kind of website for religious or church institutions. With this Church multipurpose WordPress theme, you can create a simple church website or a complex feature packed church/religious websites to accept donations and many more features. This is a dedicated Church WordPress Theme with Events, Sermons, and Donations. You can even use this theme to create Pastor’s personal website along with the blog. Besides Churches, this WordPress website template can be used to create any kind of religious websites. You can use it to create a website for temples, mosques, or any other religious institutes. Besides basic Church websites, you can create a Church website with event listings. Display the upcoming events right through your church website. This WordPress church theme also works great for a charity or a non-profit website. You can create a website for causes or social problems, awareness, etc. You can blog about it and even allow the interested visitors to make donations. It can even be used for your DIY project for a local church website. So, you can use this Premium church WordPress themes for almost any non-profit purpose. How long can I use this Church WordPress theme? Once purchased, you can use this church theme to create websites for your religious communities as long as you want. You get the support and updates for one year. After the one year, you can still use the theme without support and updates. What should I do if I want to use this theme without the donation feature? You can definitely use this WordPress Church theme without the donation feature. If you want to create a really simple church website, this theme works for that too. Simply remove the donation page and the buttons from your website and you are good to go. Do I have to pay extra for receiving donations through my website? No, you don’t need to pay extra for the donation feature on your WordPress Church Website. Neither you have to download or buy a separate plugin for it. The feature is inbuilt and ready to use. Can I use this theme to create a church directory website? This Church WordPress theme is flexible enough to create any kind of website. But doing so needs extreme customizations. Alternately, you can use this directory WordPress theme, with customizable post types to create a church listing website. Can I use this theme as a church management software? The Church WordPress theme is a website template and you can use it to create an informative and feature packed church or religious website. But it does not include church management features like staff management, event scheduling, donation handling etc. For features like that, you will need a dedicated church Management software. What do I need to start accepting donations through this church website? This church theme comes with all the features you need to start accepting donations right away. No additional plugin is required for that. The only thing you’ll need to start receiving donations is a PayPal account. Just link your PayPal account to your website and you can start accepting donations.